AppleInsider didn't think Open and Save dialogs needed fixing, but it turns out that they could be improved —and this app does it so well you might get addicted. You open and save documents on your Mac all day long. Default Folder X is the latest version of a long-running app, and still makes it faster to find what you're after and to choose where to keep them. In its latest version, Default Folder X 5.1.5 handles those minimized Save dialogs that Apple is so fond of. In practice, all Default Folder X does for those is add a button that expands them out into the regular, full-size Save dialogs. You really don't need that because you can click on Apple's own button to the side of the file name. Yet, anecdotally, we've seen countless people either not notice Apple's button or just not understand it. It's a shame because those people are unlikely to become Default Folder X users even though it would help them. You need to understand and better yet have felt weary at how much clicking you do every day. That's perhaps Default Folder X in microcosm: you don't truly need it yet if you are even a little experienced on your Mac, you quickly see how much faster and handier it is when you've got it. It's so much faster and handier that it's difficult to go back and it's very easy to wish there was a version for the Finder. Its chief purpose since version 1 has been to help out when you're opening or saving documents over and over again. If you always save your Pages documents in a folder called Novel then the next time you click Open or Save/Save As, Default Folder X can make sure that's where you are. You can still navigate anywhere else you like, but the default in Pages could be Novel. So hit Save, write a title, hit Return and you know that you've saved the document in the right place. Similarly, if you work with Excel documents that are always on a server somewhere across your office's network, Default Folder X saves you have to schlep through finding it. It's just there when you choose Open in Excel. If that were all it did, it'd be convenient but you would forget that it was there and it'd be unlikely to have needed to reach version 5.1.5. The major version 5 update made Default Folder X do its stuff with the latest macOS and added a new look plus assorted improvements. The look is important because as well as routing you to specific folders you've chosen, the app presents many other options. It presents them in a faintly ghostly wraparound of the regular macOS Open and Save dialogs. Previous versions of the app had this in black where now it's a white and somehow seems vastly more intrusive. You see the same dialog you always did but surrounding it are new functions. To the right there are icons for setting up, for instance, that the Novel folder is your favorite when you're using Pages. There's also a Recent Files, Recent Folders and more. Recent Files does replicate the Open Recent feature from most apps and it is the same simple list. However, having Recent Folders is already better because you're so often choosing a file from the same place you were last in. Then as well as a list of recent folders, each entry has a pop-out menu that means you can drill down into subfolders. Utterly gorgeously, you can also do this. While you have the regular Open or Save dialog box on the screen, you can click anywhere else on your desktop. 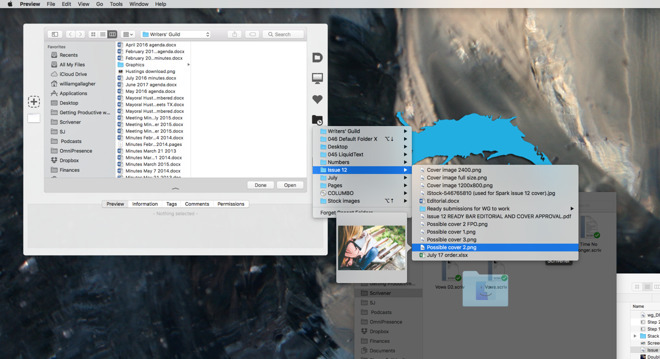 Click on a corner of a Finder window you've got open and the Open/Save dialog will jump to that same folder. 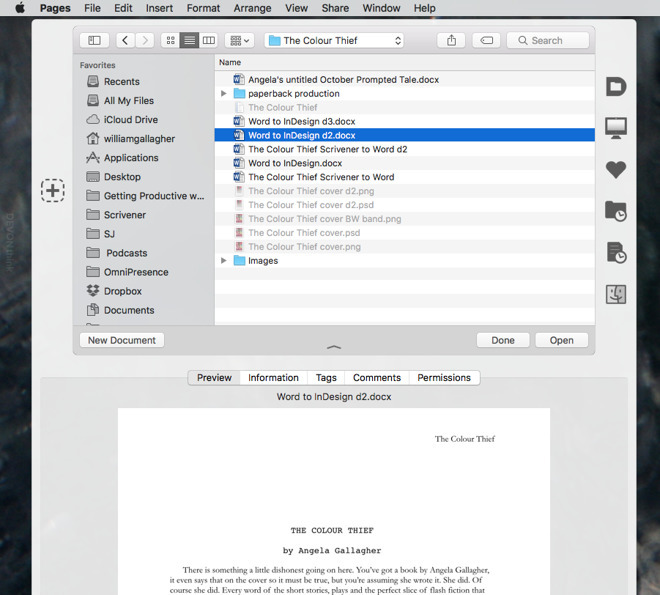 In the screenshot above, notice how a Finder window is greyed out behind the pop-out menu. That's Default Folder X showing that you can click on the window to make that where you're Opening or Saving. When you're opening documents, Default Folder X also gives you a large preview. Apple does that when you change to a column view and click through to what you want but even then it's just a thumbnail. 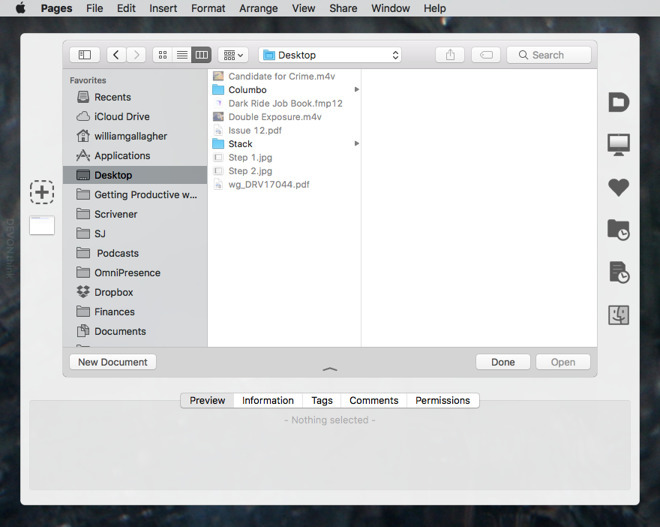 Default Folder X shows you the document large and clear right underneath the Open box. If you're drilling down through many levels of recent folders and pause on a document, it will quickly show you a reasonable-sized thumbnail. If you don't immediately move off, it turns that into a much larger preview. It all just means you now rarely open the wrong thing. If you keep opening the same document, then you can drag it to the left side of the Open box and create a little shelf of regular favourite documents. It works and it's handy but Default Folder X displays them as small visual buttons rather than text. If you have a few of them then it's hard to immediately see which is which. Then if you drag the Open or Save dialog box anywhere, it can take a distracting beat for Default Folder X's wraparound controls to catch up. The only place Default Folder X truly falls down, though, is how things have changed since it originally launched. If you're writing in Ulysses, for one example, you never open or save anything. If you're working in Apple apps like Pages then you might not be saving because it does that for you. You might write something and then share it over email rather than save it. Apps have changed. They don't always have Open and Save. Consequently, you might have seen more of Default Folder X's work in the past —but it's still superb at what it does now. 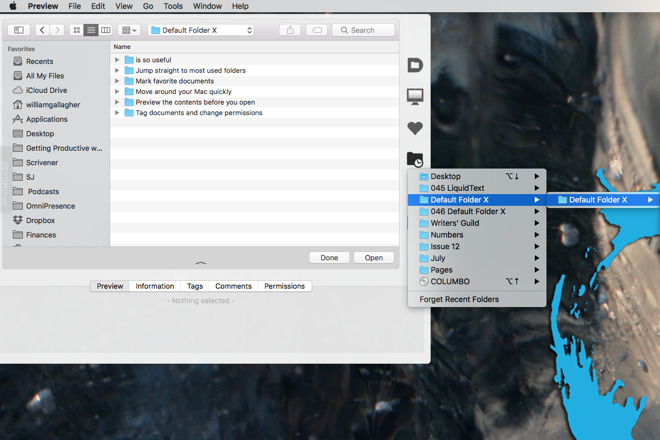 Default Folder X costs $34.95 and is available directly from the maker. One more thing —we switched off Default Folder X in order to get a screenshot of Apple's minimized dialog and so instantly missed having it on that we rushed back.